Beans are a really important part of a vegetarian or vegan diet. They are a great source of protein, fibre and iron. They're really filling too and low in fat, so pretty darn perfect. 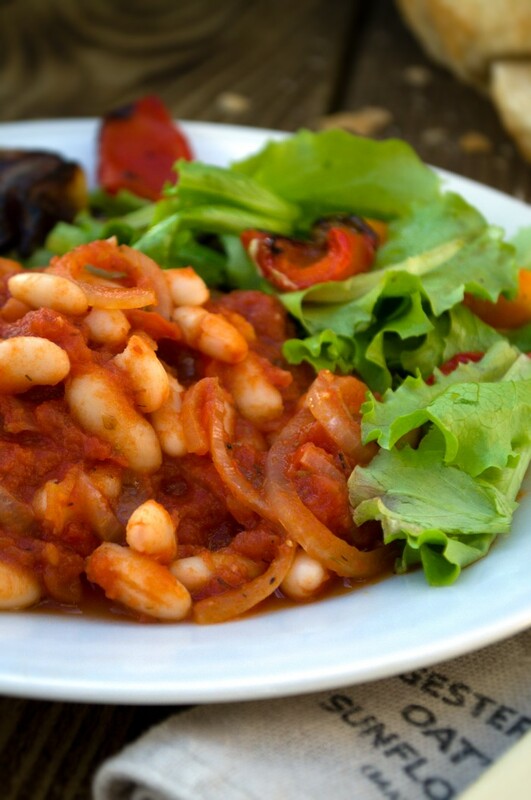 We love baked beans on toast, adding a variety of beans to our chilli, making them into pate, mixing beans through salads or in a simple dish like this fasolia gigantes, which is basically a simple Greek bean dish. This is originally a peasant dish. As you travel the world you'll find many local veggie dishes started out this way. They were cheap and would feed a family easily. I'm not complaining. To me this is a feast. Graham and I first had this dish in a Greek Cypriot home in the hills just outside Paphos in South Cyprus. The family served meat and fish dishes too, but we happily tucked in to this bean dish with salad and freshly baked village bread. When I got home I had to recreate it and I've been tweaking it over the years. It's easy to make, frugal and full of flavour. 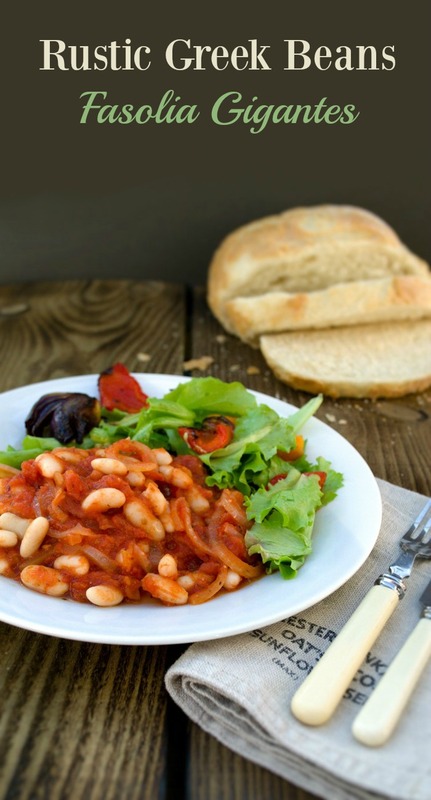 A peasant Greek Bean Stew made with cannellini beans. A great family meal that's easy to pull together and very tasty.Serve with salad and crusty bread or with a selection of veg. 1. In a large pot saute the onion and garlic in the olive oil until the onion is soft. 2. Add the beans and tomatoes.3. Add all the spices, vinegar and wine.4. Bring to the boil, then reduce to a simmer, cover and cook for 30-40 minutes until the sauce is rich.5. Season with salt and pepper.6. Enjoy. 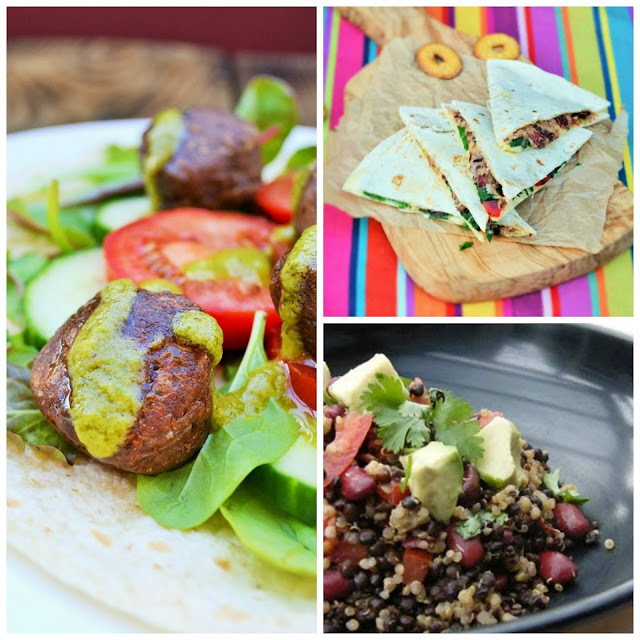 Kidney Bean Falafel, Bean, Spinach & Red Pepper Quesadillas and Quinoa Lentil & Bean Salad. 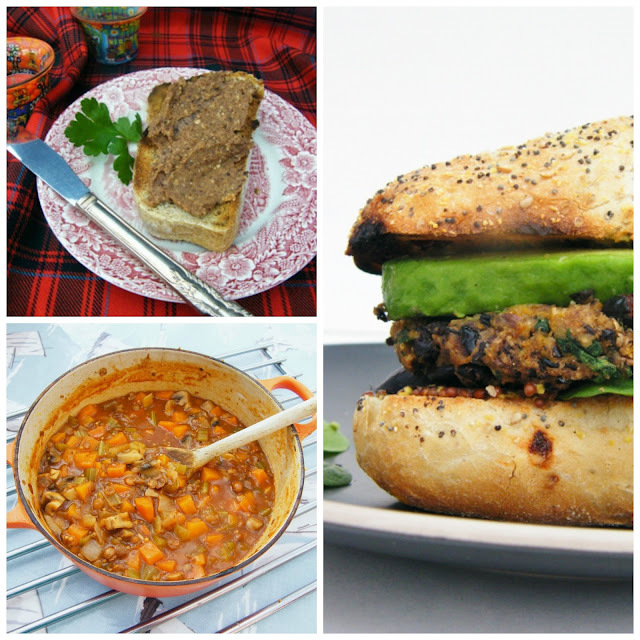 Spicy Black Bean Pate, Cajun Spiced Black Bean Burgers and Savoury Lentil & Bean Stew. This looks so hearty and delicious. Definitely a vegetarian recipe that will keep you full! Yes it is filling and very comforting. Sometimes I just need warm comforting food like this (which I comepletely forget about). Thanks for the reminder. It's easy to forget the simple dishes Bintu, but they are good and worth making regularly. They are always the best, but then they are old recipes made again and again, usually with lots of veg. Yum!! These greek beans sound amazing!! Thanks for the recipe, I can't wait to try it! What a lovely recipe! It looks so rich and good. I like that you can just let it simmer until you're ready to eat it. Yes that's definitely one of it's high points! I never think of beans when I think of Greek food but this sounds delicious and beautiful with the wine in as well! Yum, I love a good bean dish! You could serve this with all sorts. Yes they are the best recipes rather than what they think tourists expect. Beans are a huge part of our diet, and there is so much that you can do with them, like you have shown here! I love it when I find naturally vegan/veggie dishes abroad, without having to order off the menu. Yes and such simple dishes too. Are they Greek or Turkish Cypriot Sally? We had it in a home in the south and as a side dish in the north. Greek baked beans. Lookin' good. Recently started adding more pulses to our diets. My daughter loves them, now only to convince my son! Yes I suppose they are. Although they were served in a big bowl alongside salad. This looks so comforting and hearty especially with a big piece of crusty bread :) Any suggestions on what I might be able to substitute for the wine? You could leave it out Brie, I just think it gives a richer flavour and the alcohol is burned off during cooking. I love cooking beans and like how varied they are in utility. Travelling is fun for this and more reasons to me - getting to know local flavours and family favourite recipes. Yes you are right and beans are rather fabulous in all their shapes and colours. I love Greek beans. Sometimes I'll make up a big batch and then pimp them up the next day with feta on top and grilled in the oven for a beany bake. Oh Jac, that looks fabulous indeed. I adore beans and this sort of dish is one of the best. I'm hungry now and it reminds me about the dish that my mom used to make it!